Sarah grew up in Richmond, Virginia, where her mother was a violinist in the Richmond Symphony and Sinfonia. She started Sarah and her two sisters, Rebecca and Miriam, on violin when they were very young, but Sarah found the cello more interesting. "I had already begun the violin but I told my mother the cellos seemed so exciting in the Richmond Symphony," Sarah says. "Within 24 hours, she had a cello in hand and a lesson scheduled. Mr. Cartwright was my first cello teacher – my first lesson was on April Fool's Day. I now own Mr. Cartwright's former cello and keep a picture of him in its case." Sarah's sister Rebecca now plays violin in the Württemberg Chamber Orchestra in Heibronn, Germany. Miriam is an architect in Baltimore, Maryland. Sarah's partner, Barbara Bell, is an acclaimed author and award-winning documentary filmmaker, poet, and songwriter. 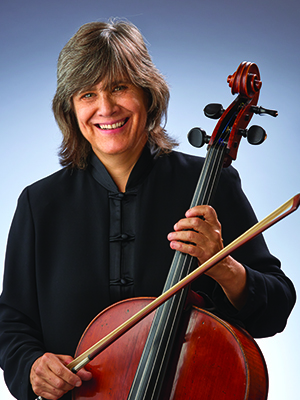 Since moving to Indianapolis in 1980, Sarah has been very active in the local chamber music scene, playing trios with Hidetaro and Zeyda Suzuki and many other performances with Suzuki and Friends. She also co-founded the quartet Quattra with fellow ISO musicians Jennifer Greenlee, Victoria Griswold and Amy Kniffen. "For me, the classic and contemporary repertoire creates an experience of immersion," Sarah says. "It grabs me and won’t let go. Late in life, I'm beginning to also enjoy many of the popular artists to which my friends introduce me." Sarah learned mountaineering in Outward Bound and has backpacked throughout Colorado. Her avid interest in photography has led to experimentation with vintage cameras, toy cameras, and the creation and use of pinhole cameras.